Vasant Panchami, also spelled Basant Panchami, is a festival that marks the preliminary preparations for the arrival of spring, celebrated by people in various ways depending upon the region. The Vasant Panchami also marks the start of preparation for Holika and Holi, which take place forty days later. The Vasant Utsava (festival) on Panchami is celebrated forty days before Spring, because any season's transition period is 40 days, and after that the season comes in to full bloom. Vasant Panchami is celebrated every year on the fifth day of the bright half of the Hindu luni-solar calendar month of Magha, which typically falls in late January or February. Spring is known as the "King of all Seasons", so the festival commences forty days in advance. (It is generally winter-like in northern India, and more spring-like in central and western parts of India on Vasant Panchami, which gives credence to the fact that Spring is actually in full bloom 40 days after the Vasant Panchami day). The festival is particularly observed by Hindus in India and Nepal, it's also has been a historical tradition of Sikhs as well. In southern states, the same day is called Sri Panchami..
On the island of Bali and the Hindus of Indonesia, it is known as "Hari Raya Saraswati" (great day of Saraswati). It also marks the beginning of the 210-day long Balinese Pawukon calendar. Goddess Saraswati dressed in yellow sari on Vasant Panchami, Kolkata. She sits in a swing, holding a veena, with books in one corner. Vasant Panchami is a festival that marks the beginning of preparations for the King of all Seasons, Spring. It is celebrated by people in various ways depending on the region. Vasant Panchami also marks the start of preparation for holiday and holi which occurs forty days later. For many Hindus, Vasant Panchami is the festival dedicated to goddess Saraswati who is their goddess of knowledge, language, music and all arts. She is the energy of Brahma, and she symbolizes creative energy and power in all its form, including longing and love (kama). The season and festival also celebrates the agricultural fields' ripening with yellow flowers of mustard crop, which Hindus associate with Saraswati's favorite color. People dress in yellow saris or shirts or accessories, share yellow colored snacks and sweets. Some add saffron to their rice and then eat yellow cooked rice as a part of an elaborate feast. Many families mark this day by sitting with babies and young children, encouraging their children to write their first words with their fingers, and some study or create music together. The day before Vasant Panchami, Saraswati's temples are filled with food so that she can join the celebrants in the traditional feasting the following morning. In temples and educational institutions, statues of Saraswati are dressed in yellow and worshiped. Many educational institutions arrange special prayers or pujas in the morning to seek blessing of the goddess. Poetic and musical gatherings are held in some communities in reverence for Saraswati. 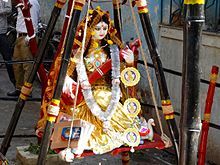 In Nepal, Bihar and eastern states of India such as West Bengal including north-eastern states like Tripura and Assam, people visit her temples and worship her (Saraswati Puja). Most of the schools arrange special Saraswati puja for their students in their premises. In Bangladesh, all major educational institutes and universities observe it with holiday and a special puja. In the state of Odisha ,The festival is celebrated as Basanta Panchami/Sri Panchami /Saraswati Puja. Homas and Yagnas are done in Schools and Colleges across the state. Students celebrate Saraswati Puja with great sincerity and fervor . Usually, toddlers start learning from this day in a unique ceremony named 'Khadi-Chuan'/Vidya-Arambha. In southern states such as Andhra Pradesh, the same day is called Sri Panchami where "Sri" refers to her as another aspect of the one goddess Devi..
Vasant Panchami, in some parts, celebrates the Hindu god of love Kama (left) with Rati, shown above at the Khajuraho temple. Another legend behind Vasant Panchami is based on the Hindu god of love called Kama. Pradyumna is Kamadev personified, as we learn from Krsna Book. Thus Vasant Panchami is also known as "Madana Panchami". Pradyumna is the son of Rukmini and Krsna. He awakens the passions of the earth (and it's people) and thus the world blooms anew. It is remembered as the day when Parvati approached Kama to wake up Shiva in Yogic meditation since the Maha Shivaratri. The other gods support Parvati, and seek Kama's help to bring Shiva back from his meditation to do his duties in the world. Kama agrees and shoots arrows, made of flowers and bees, at Shiva from his heavenly bow of sugarcane in order to arouse him to pay attention to Parvati. This initiative is celebrated by Hindus as Vasant Panchami. Vasant Panchami is associated with the emotions of love and emotional anticipation in Kutch (Gujarat), and celebrated by preparing bouquet and garlands of flowers set with mango leaves, as a gift. People dress in saffron, pink or yellow and visit each other. Songs about Krishna's pranks with Radha, considered to mirror Kama-Rati, are sung. This is symbolized with the Hindu deity Kamadeva with his wife Rati. Traditionally, in Maharashtra, Madhya Pradesh, Chhattisgarh and Uttar Pradesh, after bathing in the morning, people worship Shiva and Parvati. Offerings of mango flowers and the ears of wheat are traditionally made. The shrine of the Sun-God in Aurangabad district, Bihar known as the Deo-Sun Shrine, was established on Basant Panchami. The day is celebrated to commemorate the founding of the shrine by King Aila of Allahabad and the birthday of the Sun-Deo God. The statues are washed and old red clothes on them are replaced with new ones on Basant Panchami. Devotees sing, dance and play musical instruments. A kite flying at Basant Panchami event. At least since the 19th century, kite flying on Basant has been a popular event in north India well as in the region around Lahore, Pakistan. Kite flying is also traditional in west India on Uttarayan, in Mathura on Viskwakarma Puja and in south India. People celebrate the day by wearing yellow, eating sweet dishes and display yellow flowers in homes. In Rajasthan, it is customary for people to wear jasmine garlands. In Maharashtra, newly married couples visit a temple and offer prayers on the first Basant Panchami after the wedding. wearing yellow dresses. In the Punjab region, Sikhs and Hindus wear yellow turban or head dress. In Uttarakhand, in addition to Saraswati Puja, people worship Shiva, Parvati as the mother earth and the crops or agriculture. People eat yellow rice and wear yellow. It is also a significant school supplies shopping and related gift giving season. In the Punjab region, Basant is celebrated as a seasonal festival by all faiths and is known as the Basant Festival of Kites. Children buy Dor (Thread) and Guddi or "Patang" (Kites) for the sport. The people of the Punjab wear yellow clothes and eat yellow rice to emulate the yellow mustard (sarson) flower fields, or play by flying kites. According to Desai (2010), the tradition of flying kites on various festivals is also found in northern and western Indian states: Hindus in Rajasthan and especially in Gujarat associate kite flying with the period prior to Uttarayan; in Mathura (Uttar Pradesh), kites are flown on Dussehra; in Bengal kite flying takes place on Viskwakarma Puja in September. The sport is also found in Maharashtra, Madhya Pradesh and parts of south India. On Bali and among Indonesian Hindus, Hari Raya Saraswati (the festival's local name) is celebrated with prayers in family compounds, educational institutions, and public venues from morning to noon. Teachers and students wear brightly coloured clothes instead of their usual uniforms, and children bring traditional cakes and fruit to school for offerings in a temple. Namdhari Sikhs have historically celebrated Basant Panchami to mark the beginning of spring. Other Sikhs treat it as a spring festival, and joyfully celebrate it by wearing yellow colored clothes, emulating the bright yellow mustard flowers in the fields. Maharaja Ranjit Singh, the founder of the Sikh Empire, encouraged the celebration of Basant Panchami as a social event in the Gurdwaras. In 1825 CE he gave 2,000 rupees to the Harmandir Sahib Gurdwara in Amritsar to distribute food. He held an annual Basant fair and sponsored kite flying as a regular feature of the fairs. Maharaja Ranjit Singh and his queen Moran would dress in yellow and fly kites on Basant Panchami. Maharaja Ranjit Singh would also hold a darbar or court in Lahore on Basant Pachami which lasted ten days when soldiers would dress in yellow and show their military prowess. In the Malwa region, the festival of Basant Panchami is celebrated with wearing of yellow dress and kite flying. In Kapurthala and Hoshiarpur, a Basant Panchami fair is held. People attend the fair awearing yellow clothes, turbans or accessories. Sikhs also remember the martyrdom of the child Haqiqat Rai on Basant Panchmi, who was arrested by the Muslim ruler Khan Zakariya Khan after being falsely accused of insulting Islam. Rai was given the choice of converting to Islam or death and, having refused conversion, was executed on the Basant Panchami of 1741 in Lahore, Pakistan. Kite flying in Lahore goes back centuries. After creation of Pakistan it evolved into a highly competitive sport which is not limited to “basant” only. There are regional teams, competitions and trophies. Kite And string making is an industry all over central Punjab providing livelihood to thousands. Given the shared history and culture in the Indian subcontinent, the Punjabi Muslims in and around Lahore also celebrate kite flying as a sport in Pakistan from home rooftops during the Basant season. According to Lochan Singh Buxi, Basant Panchmi is a Hindu festival adopted by some Indian Muslim Sufis in the 12th century to mark the grave of the Muslim Sufi saint dargah of Nizamuddin Aulia in Delhi and ever since, has been observed by the Chishti order. According to local Sufi traditions, the poet Amir Khusrau saw Hindu women carry yellow flowers to a temple on Basant and they were dressed in yellow, and he adopted this practice, one the Chishti order of Sufi Indian Muslims continue to practice. The Gujarat government has encouraged the observance of Saraswati Puja in schools on Vasant Panchami, a proposal that has been opposed by Indian Muslims because it is a religious festival of Hinduism. Vasant Panchami has been a historic occasion of dispute at the archaeological site of Bhojshala (Dhar, Madhya Pradesh) with evidence of an early Saraswati temple (locally called Waghdevi). On the site of Bhojshala is a later era Kamal-Maula mosque, which Muslims use for Friday prayers. The Archeological Survey of India (ASI) has provided annual guidelines, when the Vasant Panchami festival falls on a Friday, announcing hours when Hindus can worship at Bhojshala on Vasant Panchami, and when Muslims can. However, in past years, the community scheduled earlier has refused to vacate the premises, leading to riots and disorder such as in 1980s and 1990s. ^ a b c d Nikky-Guninder Kaur Singh (2011). Sikhism: An Introduction. I.B.Tauris. p. 87. ISBN 978-0-85773-549-2. ^ a b c d James G. Lochtefeld (2002). The Illustrated Encyclopedia of Hinduism: N-Z. The Rosen Publishing Group. pp. 741–742. ISBN 978-0-8239-3180-4. ^ "2017 Official Central Government Holiday Calendar" (PDF). Government of India. Retrieved 4 March 2017. ^ a b Christian Roy (2005). Traditional Festivals: A Multicultural Encyclopedia. ABC-CLIO. pp. 192–193. ISBN 978-1-57607-089-5. ^ a b c d e f R. Manohar Lall (1933). Among the Hindus: A Study of Hindu Festivals. Asian Educational Services. pp. 27–33. ISBN 978-81-206-1822-0. ^ a b c d e J. Gordon Melton (2011). Religious Celebrations: An Encyclopedia of Holidays, Festivals, Solemn Observances, and Spiritual Commemorations. ABC-CLIO. pp. 902–903. ISBN 978-1-59884-206-7. ^ "Bali Cultural Ceremony and Ritual". Balispirit.com. Retrieved 8 October 2017. ^ R. Manohar Lall (1933). Among the Hindus: A Study of Hindu Festivals. Asian Educational Services. pp. 27–29. ISBN 978-81-206-1822-0. ^ a b c Nikita Desai (2010). A Different Freedom: Kite Flying in Western India; Culture and Tradition. Cambridge Scholars Publishing. pp. 32–34, 60, 99–100, 151. ISBN 978-1-4438-2310-4. ^ Satwant Kaur Rait (2005). Sikh Women in England: Their Religious and Cultural Beliefs and Social Practices. Trentham. pp. 43–44. ISBN 978-1-85856-353-4. ^ Camille Mirepoix (1967). Now Pakistan. Grenich. p. 142. ^ Hasan, Masudul (1971). Unique Women of the World: Being Unique Stories of the Sidelights of the Lives, Loves, and Mysteries of Famous Women of All Times, All the World Over. Unique Publications. p. 96. ^ "The Tribune, Chandigarh, India - Bathinda Edition". Tribuneindia.com. Retrieved 17 February 2014. ^ "The Tribune, Chandigarh, India - Jalandhar Edition". Tribuneindia.com. Retrieved 17 February 2014. ^ Maan Singh Nirankari (2008). Sikhism, a Perspective. Unistar Books. p. 154. ISBN 978-81-7142-621-8. ^ Lakshman Singh (Bhagat) (2006). The Sikh Martyrs. Singh Brothers. pp. 118–122. ISBN 978-81-7205-382-6. ^ Paul E Losensky (2013). In the Bazaar of Love: The Selected Poetry of Amir Khusrau. Penguin Books. p. 27. ISBN 978-81-8475-522-0. ^ Rajendra Vora; Anne Feldhaus (2006). Region, Culture, and Politics in India. Manohar. pp. 327–329. ISBN 978-81-7304-664-3. "Vasant Panchmi", a book by Anurag Basu. "Kite Festival" by Sanjeev Narula.